Taye Diggs originated the role of the nasty landlord Benny in Jonathan Larson’s Tony Award- and Pulitzer Prize-winning Rent, which also starred his future wife, Idina Menzel. After Rent, he appeared as Mr. Black opposite Idina Menzel’s character of Kate in the hit The Wild Party. Diggs also played The Bandleader in the 2002 film version of the long-running Broadway revival of Chicago and filled in as Billy Flynn on Broadway. He is a prolific actor and he has been doing a great job as an actor in TV shows as well with one hit show after another. 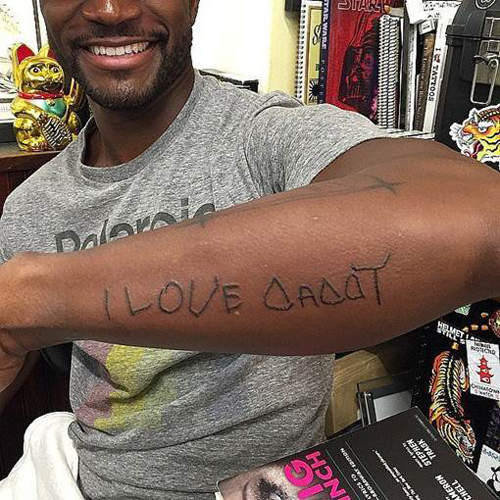 The forearm tattoo that he has in his hand is a message tattoo from his son which says “I love you daddy” in his child’s handwriting. The tattoo has been made with his child’s handwriting and he loves showing it off whenever he can. The tattoo symbolizes how much he loves his child and it is a perfect way to show off the bond between him, his wife Idina and their beautiful kid.